If you were present in the grandstands, you were a victim. If you were holding a boom mic in the pitlane, you were a victim. If you were watching a monitor somewhere among the motorhomes of the infield, or as a corner worker on the far reaches of the track, or with rapt attention at home, or even just cooking in the kitchen and came out at some point to ask what all the noise was, you were a victim of Marc Marquez’s imperious run to victory. The language is deliberate. 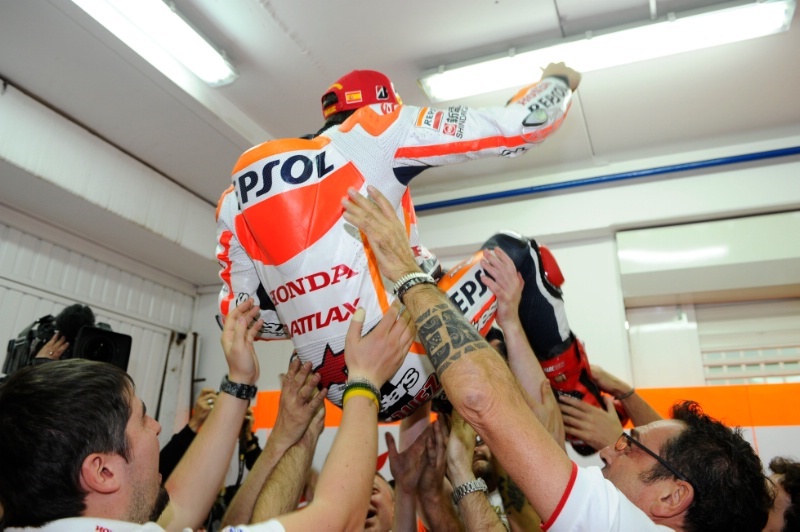 That he did it from pole, on a hard rear tire (unexpectedly able to retain the heat and grip necessary to run at the front), six weeks after fracturing his fibula, one week after he had started to walk again, is worth as much as his world championship last year; it is the strongest indication yet that we have entered His Time. Among the sands of one earth’s 44 remaining monarchies, we have arrived. We are in Marc Marquez’s imperial phase. I’m not sure if it was a 1996 BBC Radio 1 documentary that first recorded the idea for posterity, but, in any event, Neil Tennant of the Pet Shop Boys has been credited for giving name to the zeitgeist-like phenomenon of an “imperial phase.” Stay with me: The word “imperial” comes via Old French from the Latin imperialis, or “of the empire.” You can find variations across all the Romance languages, languages from cultures in which empires would have been commonplace and a word to describe them necessary – in Spanish, for instance, it is imperio. Applied in context, Fray Francisco de Ugalde’s memorable remark to Charles I: “El imperio en el que nunca se pone el sol.” The empire on which the sun never sets. The idea of an imperial phase was birthed out of a period in the Pet Shop Boys’ early history (starting somewhere in 1986 and definitively ending with 1988’s “Domino Dancing”) when they could do no wrong. But it wasn’t just that their music was successful; they also guided the conversation of British pop music. That embrace of the public (and vice versa) is elaborated upon more by Tom Ewing here, but the short of it is that the Pet Shop Boys are one of many artists to have seized such a unique cultural opportunity. Unpacking the term further reveals an origami fold of functions. An imperial phase does not just have to apply to music, and it is not a strictly European phenomenon. It can happen to anyone conquering a culture at any given moment. 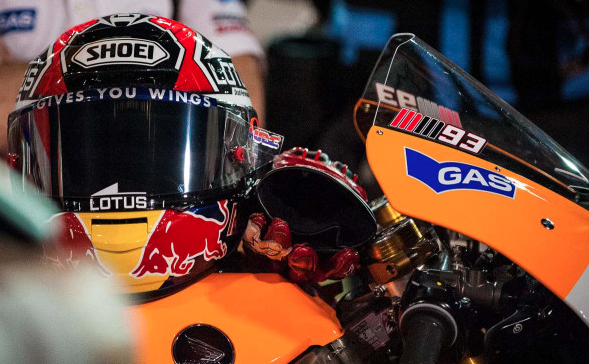 In motorcycle road racing, a slight tweak of the definition enables us to apply it to any rider who carries all the good will of the press, a visible fan base, and on-track invincibility that confounds rival riders. The imperial phase can also only happen in the top class. There have been a number of riders who have had dominant streaks in World Superbikes or the 250s, but in order to own the moment in a way that gets 16-year-old Italian kids idly arguing about you, one must conquer from the very top. A handful in the last three decades have done it: Barry Sheene in 1976-1977; Kenny Roberts from 1978 through to his defeat at the hands of Freddie Spencer at Imola in 1983; Spencer himself from Imola to the end of the 1985 season; Mick Doohan from 1995 to Max Biaggi’s debut at the beginning of 1998; and Rossi from 2002 through to Estoril 2006. Each of these phases carries with them the weight of a gift. The paddock chatter orbits around you, even when it doesn’t; results are judged not by who won but by how you lost; victories are measured across eras rather than seconds. In an interesting footnote for another entry, it is a greater power than God mode. You are inescapable and inescapably good. This is where we’re at with Marc Marquez right now. The whole offseason was a heated debate over rules changes and regulations the likes of which I couldn’t possibly hope to bore you with. Preseason testing saw new names at the top of the timesheets and a mix in the general order. Up through the fourth free practice session on Saturday, the race win was anyone’s guess. When Marquez nabbed pole (for the tenth time in 19 tries at the MotoGP level, by the way), there were doubts about his fitness for the full race distance. Then came Sunday’s 42-minute display of racecraft the likes of which we’re already growing accustomed, the pressure on Bradl early and a back-and-forth tussle with Rossi for first in the waning laps of the race. If there were doubts from what few detractors he had left beforehand, they will have gone silent now as the series moves to Austin, Texas for the second round in three weeks. Maybe it’s too early to suggest Marquez has already entered his imperial phase. But if that feels rushed, consider that it may have already started last year at Valencia when he won the world championship in his first attempt. Before Valencia, he was simply a record-breaking rookie with an agreeable grin and a penchant for racing hard; now, he is the inevitable favorite. Even with a broken leg and the disadvantage of having to run with stricter fuel reserves, he has made it work. Everyone is following his lead. Everyone is falling for him. The ascent is complete. Funny how the sun looks when you’ve flown this high and reached this far, though. That old thing about empires and Icarus.